Have you ever just touched something or held it in your hands, and it made the hair on the back of your neck stand up? Just a weird feeling? Not a bad feeling at all, just familiar somehow but you can’t explain it? That’s how I felt the first time I touched my Great-Great Aunt Thora’s beautiful serving spoons. My Aunt Shirley mailed them to me because she thought I would appreciate and love them. When I opened the box and unwrapped them, I knew I had a connection with them instantly. They last belonged to my paternal grandmother, Elsie, who was raised by Aunt Thora, which is how my grandmother came to have the spoons. They have such a rich history, and as you can see, they are lovely and intricate. All I can think of is who held them, what food was served with them, and where did they come from? 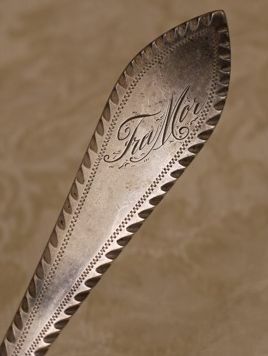 One of the spoons has the strange word, “Tra Mor,” engraved on it. I had no idea what it meant, so first thing I did was google it. Tra Mor is the name of a town in Ireland. I knew I had a Scotch-Irish background on my father’s side, so maybe that is where someone was born. If that’s true, then the life there was important enough to engrave on a spoon decades later. How I wish I could ask my grandmother the story behind the spoons, and about Tra Mor. I do know that Aunt Thora, her husband Charles, and my grandmother, Elsie, lived with a very wealthy Chicago family on the Gold Coast. Aunt Thora was a housekeeper, Uncle Charles was the chauffeur, and young Elsie was able to learn about the life of the very rich in Chicago in the early part of the 1900’s. Sort of like a “Sabrina” situation in the Audrey Hepburn movie. 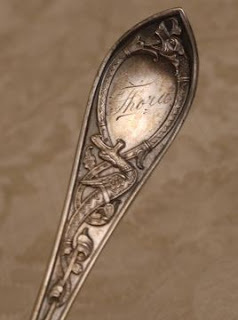 I wonder if the family bought these spoons for them as thank- you gifts for good service, or maybe as Christmas gifts. And what is the significance of this date, February 28, 1909? I don’t know if I will ever find the answers, but I do know one thing. The spoons will be handed down to my girls, who will hand them down to their children. I hope one of them will experience the same feeling I did, and will use them to serve up memorable meals to their own families. I wish I had the old cookbooks someone used, and then served up meals with these spoons. 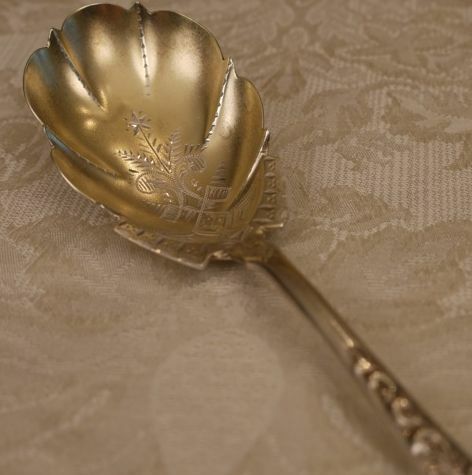 Someday, hopefully, someone may ask, who was my Great-Great Aunt Debbie, and how did she get these spoons? And I hope they will still be used and loved a hundred more years from now.